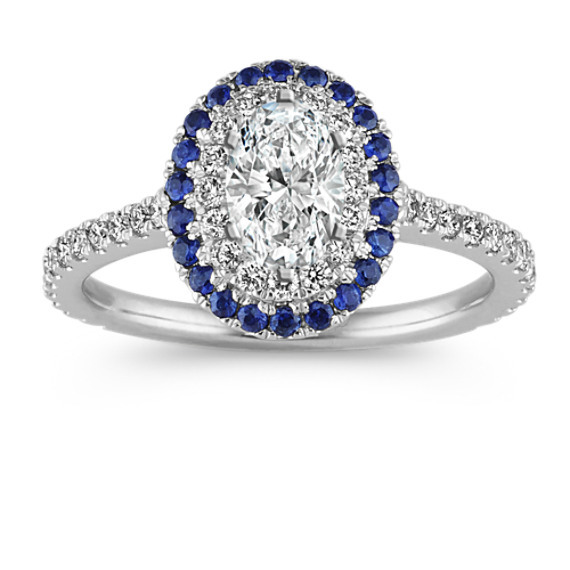 Sapphire and Diamond Halo Engagement Ring in 14k White Gold | Shane Co.
Crafted in quality 14 karat white gold, this admirable engagement ring is decorated by a lovely double halo design and is beautifully accented with 22 round traditional sapphires (approx. 20 carat TW). Sixty round pavé-set diamonds (approx. .41 carat TW) add brilliance throughout the design. Add the center oval gemstone of your choice at approximately .75 carat to make this setting your own. The ring measures 11.75mm wide at the halo and 1.5mm wide at the band. The total gem weight is approximately .61 carat.